To examine how sunspot cycles, ENSO, NAO, and NPI may influence temperature and precipitation variability in a tallgrass prairie, we conducted period-spectrum analyses of a 108-year weather record (1891-1999) from Manhattan, Kansas, approximately 12 km north of Konza Prairie. Annual mean temperature and annual precipitation totals were tabulated and expressed as anomalies. Two spectral analyses were conducted, one filtered to emphasize interdecadal-scale periodicities, the second filtered to emphasize quasi-quintennial periodicities. Annual mean temperature and precipitation values between 1891 and 1999 (figure 20.2) show interannual variability characteristic of the continental interior. Prominent peaks in precipitation occurred between 1900 and 1920, and in the 1940s and 1950s, whereas periods of drought were apparent in the 1930s and 1950s. 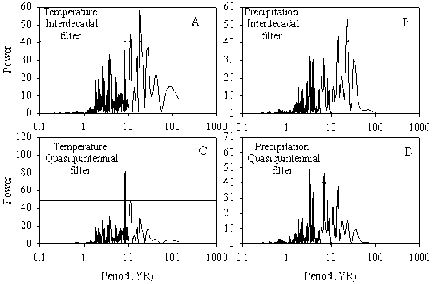 The interdecadal-filtered spectra indicate significant 14.1- and 22.8-year cycles in precipitation and 11.1- and 18.5-year periodicities in temperature (all p<0.05; figure 20.3A,B). The quasi-quintennial-filtered spectra suggested 3.3- and 6.9-year precipitation periods and an 8.4-year temperature period (all p < 0.05; figure 20.3C,D). Figure 20.3 Power spectra of 108-year climate data record at Manhattan, Kansas. (A) Temperature data, filtered to emphasize interdecadal-scale cycles. (B) Precipitation data, filtered to emphasize interdecadal-scale cycles. (C) Temperature data, filtered to emphasize cycles at the quasi-quintennial scale. (D) Precipitation data, filtered to emphasize cycles at the quasi-quintennial cycles. The periodicities in the Manhattan temperature and precipitation spectra correspond to periods reported for sunspots (11 and 22 years), ENSO (3.5 and 7 years), NAO (9 years), and NP (12 years). To test for an association between teleconnec-tions and climate pattern, we performed correlation analyses of seasonal Manhattan temperature and precipitation means over the108-year record with sunspot counts, and we reconstructed solar irradiance (Lean et al. 1995), ENSO (NINO1+2 and NINO3; Kaplan et al. 1998; Reynolds et al. 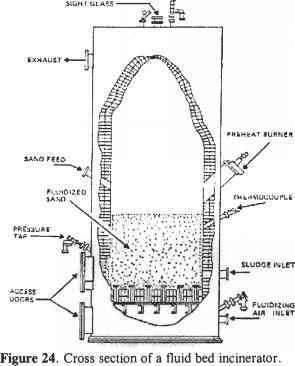 1994; Latif et al. 1998), NAO (van Loon and Rogers 1978), and NP (Trenberth and Hurrell 1994) indexes. The strongest correlations were found between NAO and winter (January-March) temperatures (r = 0.47, p< 0.0001), ENSO activity and winter precipitation (NINO1+2 r = 0.31, p = 0.0004; NINO3 r = 0.33, p = 0.0001), and the NP index and summer (July-August) temperature (r = 0.28, p = 0.0057). Other significant precipitation or temperature correlations with atmospheric processes were found, but correlation coefficients were 0.25 or less. No significant correlations were found between solar activity cycles and climate variables. This observation is consistent with the results of Baliunas and Jastrow (1993), who note that the variation in energy output in active versus quiet sun phases is small and unlikely to have detectable interdecadal effects on ecosystems. Figure 20.4 Growing-season biomass accumulation and climatic correlates in tallgrass prairie. 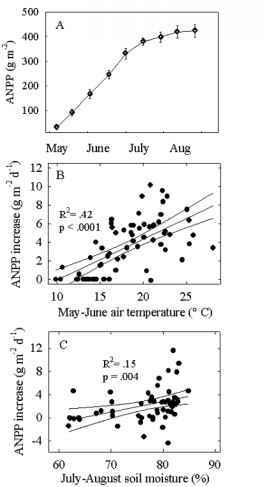 (A) Seasonal course of aboveground biomass accumulation based on 14 years of biweekly ANPP sampling (1984-1997) at Konza Prairie (means ± 1 SE). (B) Linear regression analysis of the May-June NPP increase (in g m-2 d-1) versus air temperature (± 95% confidence intervals). (C) Linear regression of the July-August NPP increase versus soil moisture. Niño/precipitation relationships have been reported (e.g., Ropelewski and Halpert 1986; Sittel 1994; Hurrell and van Loon 1997). Our results indicate a stronger influence by ENSO indexes at Konza than that noted by Greenland (1999). Greenland's analysis used a 33-year monthly data series correlated to the Southern Oscillation Index (SOI), whereas our analysis used a longer time series of coarser resolution (seasonal) data correlated to the two El Niño indices. How might climate processes impact ANPP at KNZ? To address this question, we looked at patterns of aboveground biomass accumulation derived from 14 years of biweekly harvests from two Konza Prairie watersheds (1984-1997; figure 20.4). We calculated the rate (in g m-2 d-1) of accumulation for each harvest interval and conducted regressions of accumulation rate with air temperature and soil moisture. Aboveground biomass accumulation occurred in two distinct phases, one of rapid accumulation from the beginning of the growing season (late April) through early summer (late June) and a second slower phase through the hotter, drier remainder of the growing season through September. The rate of biomass accumulation during the faster first phase was correlated with air temperature (figure 20.4B), whereas the slower second phase was better correlated with soil moisture (figure 20.4C). This suggests that ANPP in tallgrass prairie is limited by a temporally shifting set of climate factors. This result also implies that the seasonal timing of precipitation and temperature are critical factors in determining ANPP.